Gigi recently overheard me having a discussion with a local friend about how the Parisians dress almost exclusively in dark tones, especially black and especially during the fall and winter. In fact, the city itself is dressed in shades of black, and gray, and beige. It's very easy to imagine yourself in an old photo by Robert Doisneau or Henri Cartier-Bresson: the buildings are gray or tan; the sky is gray (and even when blue, it's a soft blue-gray that doesn't approach the blue of California); the cobblestones and roads are black and gray; the Seine is silvery, or black. It's a beautiful city, but beautiful in the way of a black-and-white photo. One of the things I miss most strongly about San Francisco is the vibrant color: the sky, the rainbow-painted houses, and the tie-dye/fleece fashions (if "fashion" can be used to describe it....). On the subway today, Gigi pronounces loudly, and in French, "They really are all black!" The train happens to be filled with African immigrants at the time, so it takes me a moment to make the connection back to the recent conversation on wardrobes. Since the Earth does not, as hoped, open up to swallow me whole, I have no choice but to reply loudly, "Yes! Their clothes really are mostly black... and brown, and gray! Nobody's wearing red or pink except us! Black clothing, ha ha!" At this point, the only thing redder than my jacket is my face. Parthenay -- sometimes referred to as Cabri de Parthenay -- comes in both white or black (ashed), though, if truth be told, the taste is nearly indistinguishable. The flavor of the ashed version should be just a little stronger, but frankly the difference depends more on the individual cheese you buy and how ripe/aged it is than on its color. 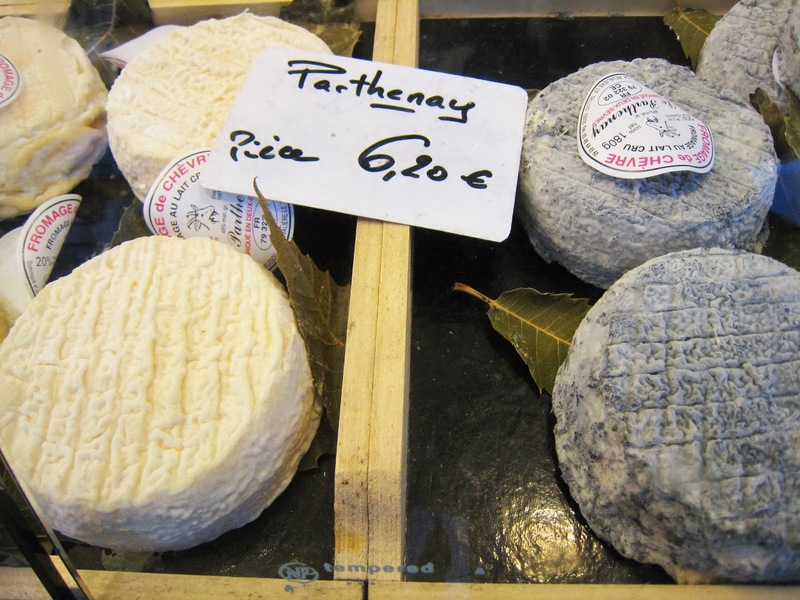 Both are very mild and creamy in a thick, nearly dry way, so much so that you can almost think of Parthenay as a slightly goaty Frenchified version of cream cheese. Sometimes simple can be quite nice, rather like a black and white photo, when you come to think of it. This raw goat cheese comes from a single family's herd in the village of Pougne-Herisson in the Poitou-Charentes region of France, in the middle of the Atlantic Coast. It's aged anywhere from two-six weeks, and of course the older it is, the stronger the flavor gets. Because it's so mild and creamy, it can be part of a fabulous dessert that satisfies the desire for rich as well as sweet: Simply drizzle it with honey or a fruit jam (quince preserves would be very French of you, but other jams would be quite nice, too). It's the black and white connection, of course. And just as people who are not racist are not actually color-blind, I see the difference in the black and white versions of these cheeses, but I recognize that under the difference in color, they're both the same (with room for individual variation). If Martin Luther King Jr. had a dream cheese, this might be it. So, of course, today's cheese and story choice is dedicated to Nelson Mandela, may he rest in peace, and may people everywhere learn not to judge the inside by outside color.